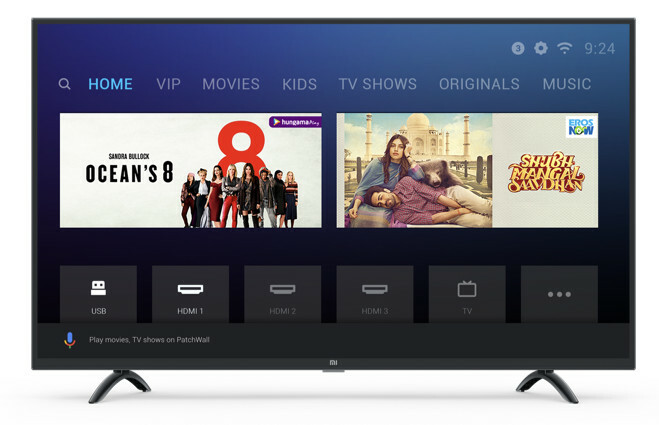 Xiaomi launched two new LED TVs the Mi TV 4X Pro and Mi TV 4A Pro in India. The Mi TV 4X Pro is a larger 55-inch variant and it sports a 4K display that also supports HDR. The Mi TV 4A Pro is a 43-inch variant that sports a 1080p panel. The new Mi TVs are powered by an Amlogic processor and run Xiaomi’s Patchwall interface with Android. The latest Mi TVs come with 20W stereo speakers for high-quality sound output. They sport thin bezels with a metallic finish that Xiaomi calls Piano Black. The TVs come with a Bluetooth remote that also supports Google Assistant voice commands. There is built-in Chromecast and the PatchWall OS offers content from partners like Hotstar, Sony Liv, Voot, Eros Now, Zee5 and more. The Mi TV 4X Pro sports a 55-inch 4K (3840 x 2160 pixels) display with 178-degree viewing angle and HDR support. It is powered by a quad-core Amlogic Cortex-A53 processor with Mali-450 MP3 GPU. It packs 2GB RAM and 8GB internal memory. The Android TV runs PatchWall OS based on Android 8.1 Oreo. Connectivity options include WiFi 802.11 ac (2.4 / 5GHz), Bluetooth 4.2 LE, 3 HDMI ports, 2 USB ports, 1 Ethernet and 1 S/PDIF port. The TV supports HDR 10, MPEG1/2/4, VP8/VP9/VC1, H.265, H.264, and H.263. It has two 10W speakers with stereo and DTS support. The Mi TV 4A Pro sports a 43-inch Full HD (1920 x 1080 pixels) display with 178-degree viewing angle. Under the hood, it gets the same quad-core Amlogic Cortex-A53 processor with Mali-450 MP3 GPU. It packs 1GB RAM and 8GB internal memory. 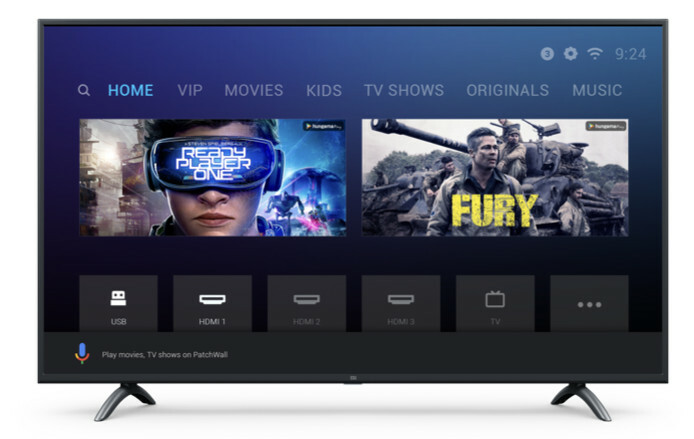 The smart TV runs PatchWall based on Android 8.1 Oreo. Connectivity options include WiFi 802.11 b/g/n (2.4 GHz), 3 HDMI ports, 3 USB port, one S/PDIF1 port, 3.5mm jack, and 1 Ethernet port. It supports MPEG1/2/4, REAL, H.265, and H.264. It also sports two 10 W speakers. The Mi TV 4X Pro 55-inch is priced at Rs. 39,999 and the Mi TV 4A Pro 43-inch is priced at Rs. 22,999. Both the TVs will be available via Flipkart, Mi.com, and Mi Home stores from January 15. Xiaomi also launched a new Mi Soundbar in India at Rs. 4,999. It will be available via Mi.com and Mi Home stores from January 16.